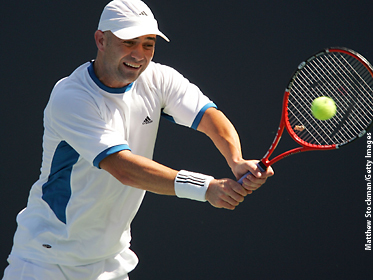 LOS ANGELES – Defending and four-time tournament champion and eight-time Grand Slam winner Andre Agassi heads the draw for the 80th Countrywide Classic, July 24-30, at the Los Angeles Tennis Center-UCLA. Joining Agassi are 2003 U.S. Open champion and 2004 and 2005 Wimbledon finalist Andy Roddick, former world No. 1 and two-time Grand Slam champion Lleyton Hewitt of Australia, two-time Grand Slam champion Marat Safin of Russia, 2004 Countrywide Classic champion Tommy Haas of Germany, Robby Ginepri, Mardy Fish, Slovakia’s Dominik Hrbaty, Paradorn Srichaphan of Thailand, and Chilean Davis Cup star Fernando Gonzalez. The doubles draw is headed by the record-setting Bryan twins, Bob and Mike, of Camarillo, who have won three of the last four Grand Slam doubles titles. Roddick received one of the three singles wild cards. Other wild cards were awarded to 18-year-old Sam Querrey of Thousand Oaks and Scott Oudesma, 20, of Kalamazoo, Mich., winner of the July 21 All-American Shootout. Four qualifiers to be determined July 24 complete the 32-player draw. Seeded players for the tournament are: 1) Roddick; 2) Hewitt; 3) Gonzalez; 4) Ginepri; 5) Agassi; 6) Haas; 7) Hrbaty; 8) Dmitry Tursunov. Players from the original ATP Official Player Acceptance List who withdrew prior to the draw due to injury or illness included: Mario Ancic, Taylor Dent, Ivo Karlovic, Ivan Ljubicic, Feliciano Lopez, David Nalbandian, Greg Rusedski and Radek Stepanek. Agassi, the Bryans and tennis great Pam Shriver (joining in as chair umpire) will be part of the high-profile, star-studded fifth annual “Gibson Baldwin Night at the Net,” Monday, July 24. Celebrity participants include actor/comedian Jon Lovitz, Entourage star Jeremy Piven and Jack and Stench from “the Jamie, Jack and Stench Show” on STAR 98.7 FM as ball boys for the event. The evening’s musical performer will be GRAMMY® Award winner Brian McKnight, and Verve Recording artist Mindi Abair will sing the National Anthem. The Countrywide Classic features a 32-player singles draw and a 16-team doubles competition. The landmark Southern California ATP tournament is the longest running annual professional sporting event in Los Angeles, and offers total player compensation in excess of $1 million.